NOTE: This Blackbox+ Radio uses a M1 (Motorola) 2-pin connector. 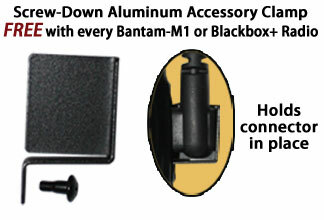 Package Includes: 1300 mAh Li-ion Battery, Rapid Rate Charger, Accessory Clamp, Antenna, Belt Clip, User Manual. PLEASE NOTE: the Blackbox+ Programming Software runs in Windows XP compatible mode.